The U.S. Air Force is expected in the near future to order a study on the potential purchase of a low-cost, light-attack fighter fleet to augment the A-10 Warthog and other aircraft flying close-air support (CAS) missions in Iraq and Syria. This study is based on recommendations for the FY 2018-FY 2022 U.S. Defense Budget in a paper by Senator John McCain, the Chairman of the powerful Senate Armed Services Committee, entitled Restoring American Power. This will not be the first such study. The Light Attack/Armed Reconnaissance (LAAR) or Light Air Support (LAS) program was established in July of 2009 with the aim of enabling the United States Air Force to buy a light counter-insurgency, ground attack and reconnaissance aircraft. That 2009 Light Attack/Armed Reconnaissance program was born out of the perceived need for a new close air support aircraft that was suited to the type of combat the United States was facing in post 2003-invasion Iraq and Afghanistan. In some ways the new requirement is a result of the failure of the previous program to convince the U.S. Air Force to acquire the low-cost, light-attack fighter fleet many observers feel is needed to supplement the aircraft currently flying close-air support (CAS) missions in Iraq, Syria and other low to medium threat environments. It would be fair to say that the U.S. Air Force did not look kindly, in the past, on the idea of a light attack aircraft for, comparatively, low threat environments. They saw funds earmarked for such a program as coming from their preferred objective of a force capable of engaging in high end combat against a near peer adversary. The feeling was that while an F-35 could be used for close air support, however inefficiently, a propeller driven light counter-insurgency ground attack and reconnaissance aircraft could never be used to attack or threaten the sophisticated integrated air defence systems fielded by some potential opponents. It may be that the current study will run into the same kind of institutional bias and be no more successful in producing a more cost efficient attack aircraft useful for the kind of lower intensity warfare that has become commonplace for U.S. forces. However in this case one of the drivers is the growing belief that between the wear and tear of constant operational use on the existing fleet and the cost of replacing that fleet the U.S. Air Force will not be able to maintain the numbers of aircraft that they would like. In the past it was assumed that the so-called “fourth generation” fighters currently fielded would help to fill the gaps in numbers caused by the higher costs associated with a new generation of aircraft. However it is becoming apparent to Air Force planners that those aircraft are not going to be available if airframe flying hours continue to be used up at the current rate. Any discussion of a low-cost, light-attack fighter invariably comes back to the same candidates. Available U.S. manufactured types are the Textron Scorpion, the Embraer/Sierra Nevada Corp. A-29 Super Tucano, the Textron-Beechcraft AT-6 Wolverine and, rather less likely, the IOMAX AT-802 Archangel. Another option would be an attack version of whichever jet trainer candidate wins the T-X program, which was established to find a new two-seat jet trainer for fast-jet training to replace the Northrop T-38 Talon. It should be noted that the T-38 itself was a development of the F-5 light fighter. Previous iterations of the search for an effective light attack and reconnaissance aircraft have always had similar results. The AT-6 is less expensive and more compatible for U.S. pilots because it is used in their training syllabus and the Super Tucano is more expensive and can carry a heavier weight of weaponry a longer distance. As it happens the A-29 Super Tucano was declared the winner in 2011 of the US Light Air Support contract competition over the Hawker Beechcraft AT-6B Texan II. The original competition assumed that approximately 100 aircraft were to be ordered but USAF has reduced the number of aircraft sought to 15 .That contract was canceled in 2012 citing concerns with the procurement process, but re-won in 2013 when twenty of these light attack aircraft were purchased for the Afghan Air Force. 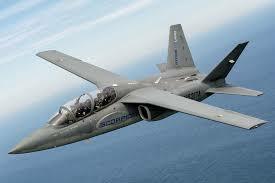 One aircraft not available at that time which now meets many of the criteria proposed for the low-cost, light-attack fighter fleet is the Textron AirLand Scorpion. This twin-engine surveillance and strike platform was designed using, for the most part, commercially available components and is priced at around $20 million apiece and costs $3,000 per flight hour to operate. Armed with observation and targeting sensors and a growing assortment of guided bombs, rockets and missiles, Scorpion is designed as a low-cost alternative for operations in non-threatening environments or perhaps even combat training and adversary “red air” services. These figures compare favourably with the prospect of providing armed over watch with a $20,000 per flight hr. Lockheed Martin F-16 Viper or $27,000 per flight hr. Boeing F-15E Strike Eagle. Even the more affordable A-10 is reported to cost more than $11,500 per flight hr. It is not known if the U.S. Air Force will ever be able to overcome institutional inertia and purchase an aircraft suitable for the wars it is fighting now. What is more relevant in the context of ‘Canadian Defence Matters’ is the question of whether the Canadian government and the R.C.A.F. will be able to find a way to purchase the kind of aircraft needed by our forces for the kinds of conflicts they are most likely to find themselves in. Those conflicts, based on recent history, involve irregular forces, be they guerrillas, bandits, narcotics groups or smugglers. And as the possibility of conflict with non-traditional state actors has increased so also have these groups become increasingly well-armed and dangerous. Adding to the danger is a focus on avoiding or at least minimizing, civilian casualties and collateral damage which require precision attacks that can bring longer exposure to enemy fire. However the growing range of small and light precision weapons available has, despite their cost, restored the edge that the aircraft have traditionally enjoyed over irregular forces. It is up to Air Forces to select the aircraft and weapons mix appropriate for the missions which can provide both adequate security for pilots along with reasonable affordability. Textron has always insisted that they originally developed the Scorpion to perform a "Multi Mission, ISR/strike platform" role. It is designed to use precision weapons to attack ground targets from a safe distance out of range of enemy defenses. Just as important from a Canadian point of view is the emphasis on ISR (Intelligence, Surveillance and Reconnaissance) which informs the design of the Scorpion. If the RCAF were to purchase the Scorpion in affordable numbers it would fill a long standing gap in ISR. Currently the only sophisticated airborne ISR platforms available to the CAF are the 14 Lockheed CP-140 Auroras included in the life-extension and modernization program. This is nowhere near the number needed to maintain reasonable surveillance of our own territory and its approaches, let alone contribute to overseas ventures or adequately support our ground forces. Scorpions could also allow 414 Electronic Warfare Squadron to field its own aircraft rather than using, and paying for, Contracted Airborne Training Services. Savings could also be found by using RCAF Scorpions, instead of the industry contracted services now used, to provide Red Air threat replication, Joint Terminal Attack Controller (JTAC) training, practice munitions drop, air-to-air gunnery training and naval target towing. Many of these services are contracted out because Canada's Air Force does not currently have suitable aircraft for these roles. Procurement of Scorpions would not only fill this void, but allow service personal to get the training and experience that is now going to private industry. From a purely political point of view the ability of these aircraft to communicate with ground forces, to find and fix a target and to loiter up to five hours will allow the government to kick the potentially divisive debate on armed drones down the road while still providing the CAF the capabilities it needs but currently lacks. It is not easy to determine what the best fighter for Canada is, what may be easier is trying to find the aircraft that are 'good enough' for Canada. There is renewed pressure on Canada to spend more on defence. If there is to be increased spending then we should insure that it is smart spending. The Scorpion, or some other low-cost, light-attack aircraft, can provide the resources the CAF needs at a price it can afford.